Feb. 8 – 2 p.m. we hav ejust docked at King George V Docks, after sailing up the Clyde. Wonderful view of the ship building yards on the way up. We are packed ready to disembark, but will not get off until 1:15 in the morning. Our train will pull out at 2:15 and we will arrive in North Farnborough Station at 5:30 p.m. Wednesday. We are not looking forward to the train trip. Feb. 9 – At 1 a.m. we disembark and entrain almost at once. Bill Findlay, Waldie, Judge, Doug Harkness, Fullerton and I occupy one compartment. At 2:15 we pull out and our first stop is at Newcastle, where we are given tea at 8 a.m. We then proceed to Nottingham where we have a lunch at 2 p.m. then pass through Banbury, Oxford, Reading and arrive at North Farnborough Station at 7:30 p.m. Am taken by truck to Salamanka Barracks. I go over to R.A.P. (Regimental Aid Post) and get swell bed with sheets. It is 10:30 and I am now going to bed, very tired. Tomorrow should be an interesting day. Feb. 10 – Musters and final separation into our different holding units. We are billeted in the Royal Pavilion. Visit Col. Hazard in the afternoon and Chas Bennett at 8th Gen. Hosp in the evening. Feb. 11 – Spent last night with Charlie at the Hospital and returned to Col. Hazard at 10 a.m. who took me over to see Maj. Gen. Roberts. I am going to build one of the jeep ambulances like we had in Italy. On Tuesday I am going to Leatherhead to see Brig. Fenwick. Don’t know what my ultimate job will be. Arrived at Worthing at 5 p.m. today. Mr. Spofforth met me at the train and we had a gorgeous meal of ham and eggs. He phoned London and had my mail sent down. Had a lovely visit. Feb. 13 – Have just arrived back in Aldershot, so don’t know what the score is yet. May learn something in the morning. Feb. 14 – Was driven out to Borden and got nicely started on my jeep – have just come in and unpacked my trunk. All the boys have gone on leave and I am absolutely alone in the building for a few days, seems most awfully quiet. Am going back to Borden again in the morning and hope to get finished tomorrow, but I rather doubt it. Am awfully tired tonight so am going to hit the hay at once. Feb. 16 – Still working on my jeep – not nearly finished yet, but today should help. Had both lunch and dinner ant Ordinance Mess today and driven into Aldershot by Capt. McKenzie. Went to Tank barracks and met nearly all 1st Bde – all XIth and 14th boys whom I knew. spent the evening with Poop and Tommy Johnson – had a grand time. Hope to see them again tonight. Poop is on draft for Italy and Tommy is going back to Canada. Everybody else is on leave here excepting myself. I hope to get away next week. Feb. 17 – Farewell party for the boys of the XIV who are returning to Italy. Poop, Ian Allison, Tommy Johnson, Mickie Mouse, Jack Forrest, Maltby and Spittal present. Have finished my jeep and it had been approved by Col. Hazard. Feb. 19 – Have to lecture to the Armoured Corps one week from Monday. Col Hazard drove me up to Army H.Q. to see Brig. 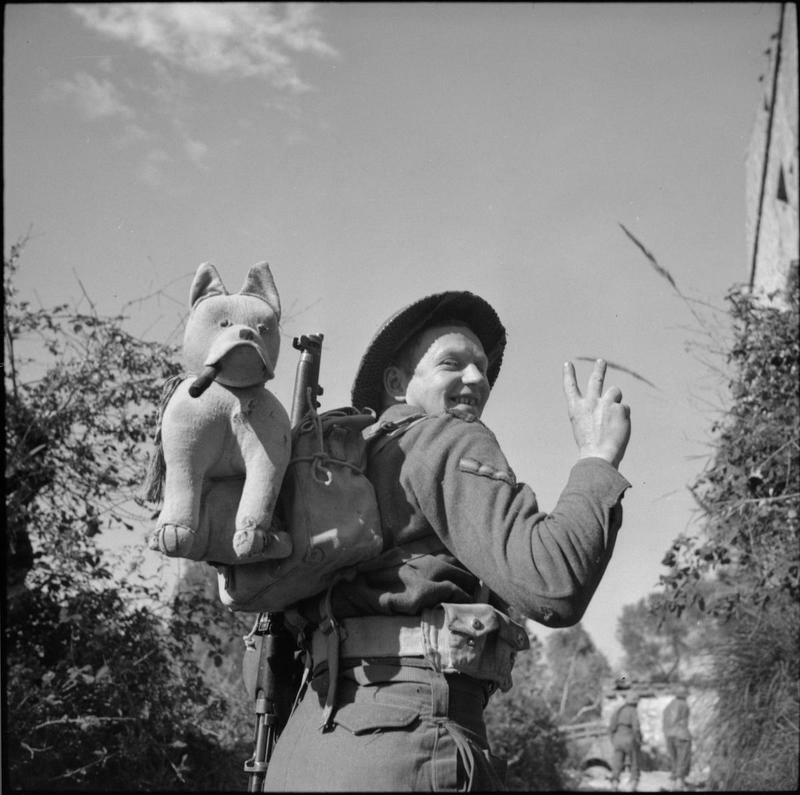 Fenwick – DDACS of Army. I am being given command of the the 6 F.D.S. (Field Dressing Station) I think, will probably know today if there are hitches in it. Will get my majority at last and not by seniority. Feb. 21 – Still no definitive word on the 6th FDS. Drove out to Borden today and brought my jeep ambulance in and demonstrated it to the General Staff. Had lunch at H.Q. I am now waiting for general instructions. Feb. 23 – Air raid both nights. Quite a few bombs dropped on London, but only the odd one around here. Capt. Williams and I took my jeep down and demonstrated it to the British Medical. Their Commercial artist from the War Office took a sketch of it. Received word today not to go on leave as my posting was coming through. 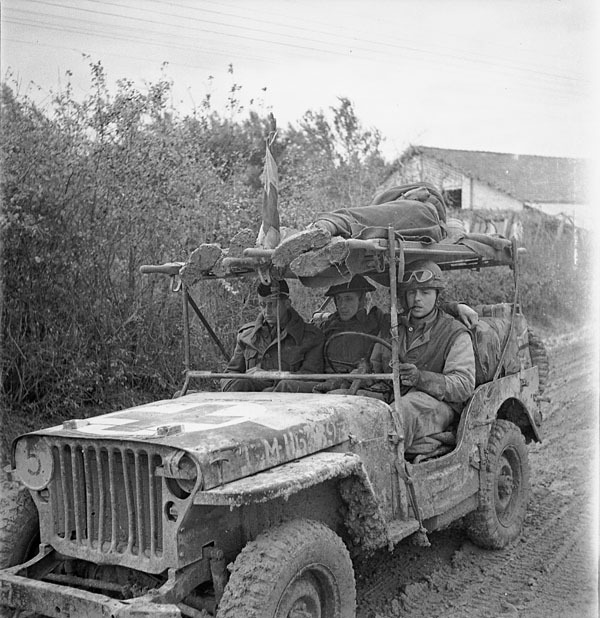 A jeep ambulance of the Royal Canadian Army Medical Corps (R.C.A.M.C.) bringing in two wounded Canadian soldiers on the Moro River front south of San Leonardo di Ortona, Italy, 10 December 1943. Feb. 1/44 – Our fifth day at sea. We are now out of sight of land in the Atlantic. The trip through the Mediterranean has been grand and our first day out in the Atlantic is also beautiful. About ten ships – all liners and we appear to be making good time. There is much more swell here than inside the Rock. Should arrive in England in about a week’s time I hope. Still going almost due west. Feb. 2 – Wednesday, our sixth day at Sea. The weather is good and we are still sailing westward. All exchange Medical Officers had a meeting this morning concerning our official duties on arrival in U.K. Present at the meeting were: Gus McCarroll from the 4th Field Amb, Williams and Townsend from the 9th F.A., and Bruce Hunter and I from the 2nd Light Fld Amb. We are the only Armoured M.O.s on board, we hope to be posted to the same Bdge. in England. Feb. 3 – Thursday – our seventh at sea. It is getting much colder and the Sea is rougher, but this ship is very steady, so we are still having a good trip. About four or five days should land us in Liverpool or Greenoch. Another ship joined our convoy this A.M. we are now sailing north, northeast. Feb. 4 – Very foggy this morning when we got up. This is Friday, our eighth day at Sea, and we are now travelling north east. Orders have just been posted announcing that we will land somewhere on Monday. This has been a wonderful trip, but it is becoming somewhat monotonous. Feb. 5 – Saturday, our ninth day at Sea. Action Stations – practice only. A lecture in the lounge this afternoon by a Major on Gen. Montgomery’s staff on the campaign of North Africa. ABout the best military lecture I have heard yet. An impromptu concert in Officers lounge this evening. Very good. It is much rougher out today. Feb. 6 – Sunday – our tenth day at Sea. rather rough and rainy today. Church in lounge at 10:30 – Maj Sutherland, who at one time was with us is to be the speaker. We should see land tomorrow. It has been a lovely trip but we will all be glad when we reach the other end and find out what we are supposed to do. Feb. 7 – Monday – eleventh day out – We sighted the North Coast of Ireland today and are now sailing through the Irish Sea. The Convoy has divided. One half appears to be going to Liverpool while we seem to going to Glasgow. Should arrive in the Clyde this afternoon, but do not expect to get off the ship until tomorrow morning. Pass “Paddy’s Mile Stone” in Clyde Estuary at 12:30 noon. Pass through boom at 3:50. 5 P.M. – now anchored in Garoch Harbour. Will proceed up the Clyde to King George Docks in Glasgow in the morning.